In 2016, China’s Fudan University Shanghai Cancer Center (FUSCC) processed 35,000 pathology cases, and is on track for another 40,000 for 2017. This daunting caseload is fielded by a team of just 50 pathologists, along with a total of 50 assistants, technicians and visiting clinicians. It’s the largest pathology department in all of China, a country in which most hospitals have only a few, or even no, dedicated pathologists. With the demand for pathology exploding in China, mostly because more patients are demanding specialized cancer care, a pathologist shortage has become a real bottleneck to advancing quality and access. A tiered system of expertise that funnels case consultations and even patients to a small number of well-staffed hospitals has been struggling to keep up. The recent and ongoing development of a private pathology industry promises to help partly bridge the gap, but won’t soon solve the problem. According to the Chinese Pathologist Association, China has 29,000 public and private hospitals with some 7 million beds for a population of 1.4 billion, but has only 20,000 licensed pathologists — about the same number as the U.S., which has about one quarter the population. As a result, most pathologists in China are overworked and forced to rush through cases, multi-tasking as best they can. And hospitals without pathologists often rely too heavily on imaging alone for complex diagnoses, or else ship cases to that small number of leading hospitals with sophisticated pathology departments, such as FUSCC. It’s not that Chinese pathologists aren’t well-trained. “The diagnostic skill level at FUSCC is not that different from that in the U.S.,” says Qifeng Wang, a pathologist at FUSCC. But Wang notes that skill isn’t enough to cope with with an exhaustive workload streaming in from multiple hospitals. The picture, he says, isn’t much different at other top hospitals with at least moderately well-staffed pathology departments, including the Cancer Hospital at the Chinese Academy of Medical Sciences, Beijing Cancer Hospital, Peking Union Medical College Hospital, West China Hospital, and First Affiliated Hospital of Sun Yan-sen University. The general lack of pathologists has drawn enormous numbers of patients throughout the country to Shanghai, Beijing and other cities with large, advanced hospitals in order to have a better chance of receiving a trustworthy diagnosis. But even mid-level hospitals can be overwhelmed with demand. The 14 pathologists at Yunnan Cancer Hospital in the city of Kunming — one of the few major cities in western China — consult in some 4,000 cases from surrounding lower-level institutions every year. They even travel out to rural areas in order to bring at least occasional pathology services to places that otherwise would never have them. All in all, they struggle to get it all done. “It’s the complex cases that make it hard to keep up with our workload.” says Yonglin Wang, a pathologist at Yunnan. He and his colleagues often turn to experts from bigger hospitals in order to deal with tougher cases — and sometimes feel obligated to send patients to those hospitals to be more sure of getting the right diagnosis. Private players could help change the picture. 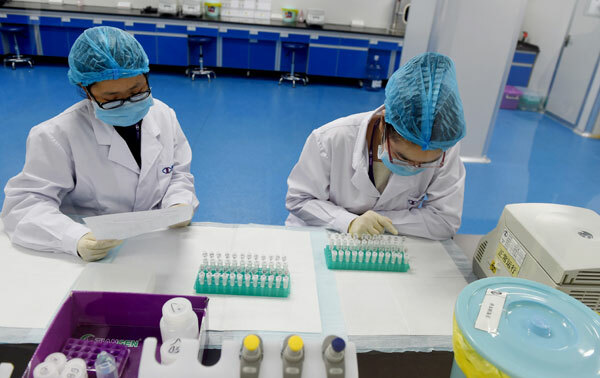 More than 300 medical laboratory companies have sprung up in China in the past decade. The largest, Guangzhou-based KingMed Diagnostics, specializes in immunohistochemistry, specialized staining, and ultrastructural and molecular pathological diagnosis, taking on more than 4,000 pathology cases every year. U.S. providers are chipping in as well. KingMed partners with the University of Pittsburgh Medical Center and University Hospitals of Cleveland Medical Center in conducting remote consultations via a digital platform. Other major private players include Adicon Clinical Laboratories, Dian Diagnostics, and Fudan Clinical Pathology Diagnosis Center. But while private providers can at least somewhat narrow the pathology gap in China, they won’t be able to come close to closing it any time soon. A fuller solution, of course, would involve a big upgrade in the number of pathologists emerging from medical schools and residencies there. Unfortunately, that boost doesn’t seem to be in the cards, as medical students tend to avoid the specialty due to its relatively lower salaries and status and its higher workloads, as well as liabilities relating to lawsuits over misdiagnoses. It may be that bringing in outside expertise is a faster, more likely solution, perhaps via a surge in telemedicine consultations with specialists outside the country. But until then, many patients throughout China seeking tumor and other diagnoses will continue to face delays, errors, unavailability, or significant travel. Changhong Zhang is a freelance healthcare writer based in Shanghai, China.